Walton - Inside. Vinyl EP. Bleep. 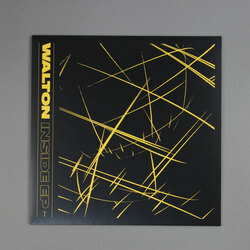 After a well-earned break to toast the success of his superb Black Lotus LP, Walton returns to Tectonic with a killer EP. The tunes on Inside take their cues from old skool pirate radio sets - from the chopped-up MC samples to the ‘Pulse X’ basslines, the sonic palette here screams after-hours Sidewinder session. However, Walton’s trick is to marry this first-wave Eski aesthetic with the carefully-crafted, bass-oriented techno of his recent work. It proves to be a match made in heaven - the likes of ‘Bullet #2’ and ‘Gunshot Clap’ will be a madness in the dance.